Faced with questions about a recent real estate transaction, Gov. 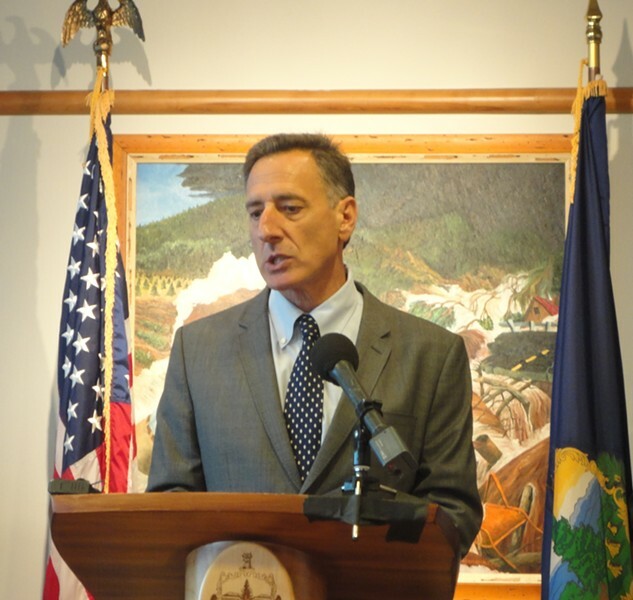 Peter Shumlin on Thursday accused a Vermont reporter of practicing tabloid journalism and then stormed out of a press conference he himself called. Though Shumlin had gathered reporters to announce a federal grant, many of their questions focused on the governor's acquisition of 27 acres of land in East Montpelier this July, on which he is building a 2200 square-foot "cabin." As Vermont Press Bureau reporter Peter Hirschfeld reported Wednesday, the real estate deal involved several friends who have contributed to the governor's campaign. After answering some questions about the transaction and declining to answer others, Shumlin lost his cool and went after Hirschfeld, who had posed several questions about the governor's decision to buy the property through a limited liability corporation. "You gonna criticize me now for forming an LLC before the rest of Vermont and America?" Shumlin snapped at Hirschfeld. "I'm just wondering why you would want —," Hirschfeld responded, before the governor cut him off mid-sentence. "I'm just wondering what you're digging for, Peter," the governor said. Hirschfeld responded, "The question is why would you want to escape liability for incidents that —"
"Have you moved from the Vermont Press Bureau to the National Enquirer?" Shumlin interjected. At this point the exchange became hard to follow, as other reporters [Disclosure: including this one] attempted to jump in. As Hirschfeld sought to ask the question again, Shumlin said, "It's been great seeing you," and stormed out of the room. Shumlin's dramatic departure capped off a press conference that veered back and forth between topics the governor did and didn't want to address. Following discussion of the federal grant, Shumlin was asked about the real estate deal, which involved the division of a 182-acre parcel of land into two pieces — one of which was sold to Shumlin and the other of which was sold to four of his friends. According to Hirschfeld, an LLC established by Shumlin bought 27 of the acres on June 11 for $35,000. The next day, the remaining 154 acres — which included a farmhouse and other buildings — were sold for $630,000 to an LLC established by David and Patrice Cromwell of Maryland and Thomas and Christianne Hagermann of Texas. Hirschfeld also reported that a more recent assessment, dated Sept. 21, pegs the value of Shumlin's new home and the two acres on which it was built at $145,600 — and the value of the other 24.6 acres he bought at $145,600. Asked at the press conference how he managed to purchase the undeveloped parcel for just $35,000, Shumlin said he and his friends divided up by acre the value of the land as determined by a previous appraisal and each paid the corresponding amount. He declined, however, to answer questions about the individuals with whom he entered into the deal. "I'm not going to get into their private lives or mine," he said. "I'm perfectly happy to share with you all aspects of my public life, but my private life is just that: private." When Seven Days noted that the individuals had also donated to his campaign — all four have given $1000 this year — Shumlin said, "Many of my friends have given to my campaign and I'm grateful to them, yes." Asked by Hirschfeld whether Shumlin believed he got a better deal because his friends went in on it with him, the governor said, "Oh, yes. Absolutely." Shumlin then explained that he'd signed a purchase and sales agreement for the entire property, but then, as he recalled, "My friends — very close friends of mine who have been looking for a farm for a very long time — came up and looked at the farm and said, 'This is a dream for us. This is the farm we've been looking for.' And they said, 'And besides, you're on a short visit to central Vermont and we'd be on a permanent one.'" Shumlin continued, "So they suggested that they buy the farm from me, take the purchase and sales agreement and peel off a small piece of land and sell it to me at a reasonable price. And that's how we got where we were." Hirschfeld: "So was that a gift to you? Would you characterize it as a gift?" Shumlin: "No, it wasn't a gift to me. It was a gift to them for me sharing the farm with them that I was going to buy. It was a mutually beneficial arrangement." Hirschfeld: "So what exactly — can you isolate what the exchange was for me? You got a great deal on a piece of land in exchange for?" 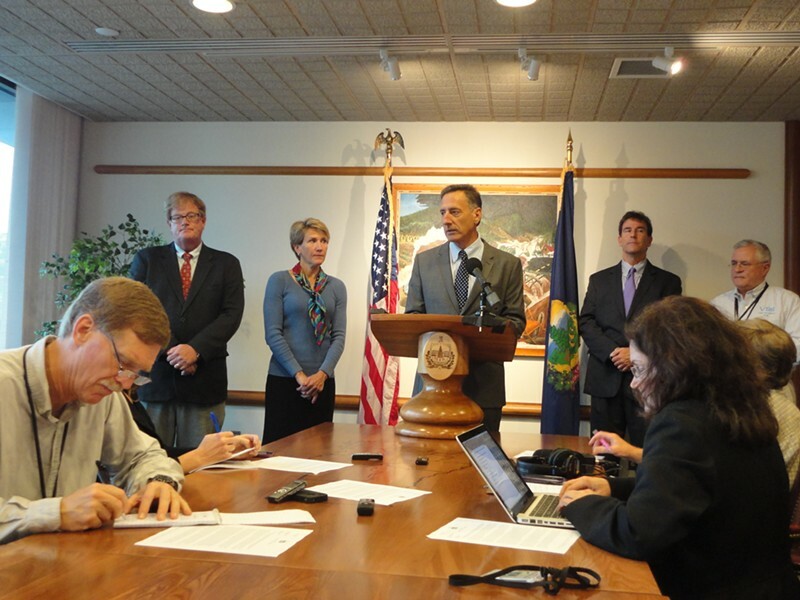 Shumlin: "For giving up buying the farm that I was planning to buy." Asked shortly thereafter by Hirschfeld how much he would have had to pay for the parcel had he bought it on the open market, Shumlin said, "I don't look at it that way, Peter, because I wouldn't have bought it. I was buying the whole farm. My friends really wanted the farm. I love my friends. It made more sense for them to have the farm because they would use it forever and I was only going use it for the period of time that I'm governor. So we made the arrangement we made." He continued: "There's nothing dishonest. There's nothing to dig up. This is not — unless you're writing for the New York Post, I can't imagine what you're digging for." Hirschfeld: "But you were given a gift of some kind from them." Shumlin: "I was not given a gift. They were given a gift, for the fact of me — we were both given gifts. I chose not to buy the farm that I was planning to buy at their pleading. And they sold me a piece of their land at a very fair and reasonable rate. We all won." When Seven Days suggested that the public may have a right to know more about the individuals with whom the governor was engaged in such a deal, Shumlin said, "Well, that's your problem. I don't agree with you on that." Hirschfeld: "I mean if you get gifts from people —"
Shumlin: "I didn't get a gift from anybody. We gave each other gifts. When I go to holidays on Dec. 25 or any other time, I don't divulge the gifts that I give or that I get. The fact of the matter is it was clearly a very fair and reasonable arrangement for everybody and we're all happy." Asked why he has not disclosed his financial assets during this election cycle, as he did when he first ran for governor in 2010, Shumlin noted that he had disclosed his income earlier in the year and said, "My assets haven't changed since the last race." "But you just bought a piece of property," VTDigger's Anne Galloway said. "How can that be true?" "I didn't own the piece of property," Shumlin responded, without explaining what he meant by that. "It's really public that I bought 27 acres of land in East Montpelier, Vermont." Later, Galloway asked Shumlin, "Who's going to be living there with you? 2200 square feet. It's a big house." The governor paused, looked around the room and, without answering Galloway, said, "Anything else you all want to talk about today?" After the Associated Press' Wilson Ring asked about the previous night's presidential debate, Seven Days noted that Galloway had asked the governor a question and that he had not answered it. "I think when I said a minute ago that my private life is just that, my private life, and I intend to keep it that way," Shumlin said. "I'm happy to talk to you about any areas of my life that have to do with my job as governor, but that's not one of them." The press corps moved on to other questions for the next 10 minutes and then returned to the real estate transaction, questioning the governor about his decision to buy the property through an LLC. After answering a few questions on that topic and explaining that he typically buys property through LLCs, Shumlin appeared to grow frustrated. It was then that he asked Hirschfeld whether he'd moved on to the National Enquirer and left the room.